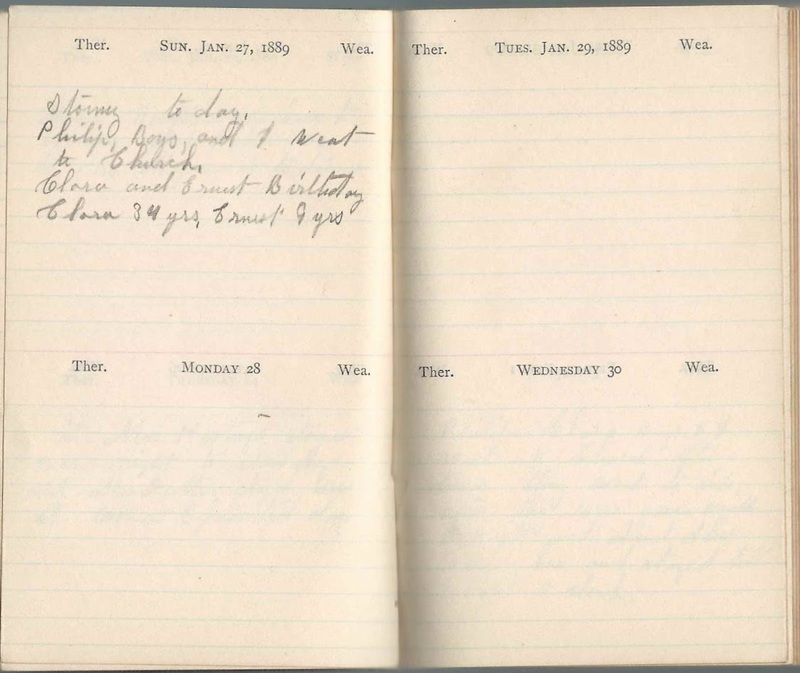 1889 diary of Cora Calista Murdock of Sherman Street, Springfield, Massachusetts. 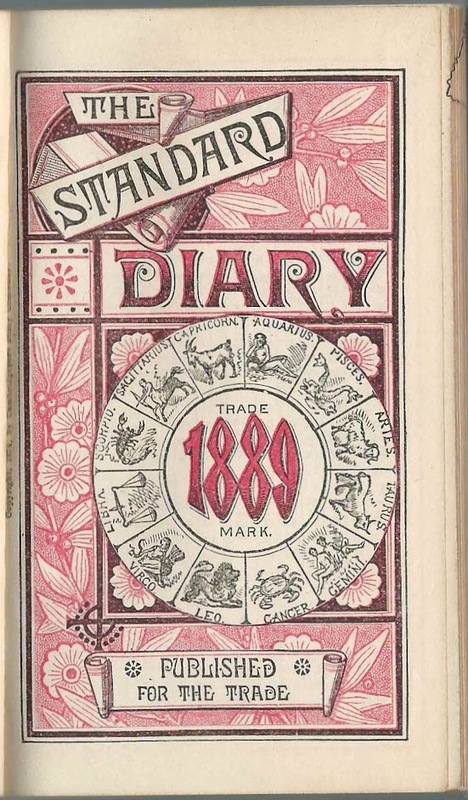 See all of the pages in the diary at the end of this post. Cora's observations are laconic and deal mostly with the weather and her visits to others and their visits to her family. There are a few noteworthy entries, though, which describe the good and bad of life in that era. 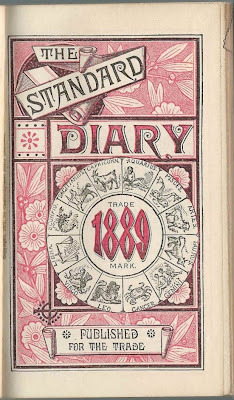 The diary measures approximately 4-3/4"by 3-1/4" and contains spaces on each page for two days for the 12 months of 1889, plus almanac-type information in the front and pages at the back for Cora to list expenses, letters, notes, etc., some of which she used. 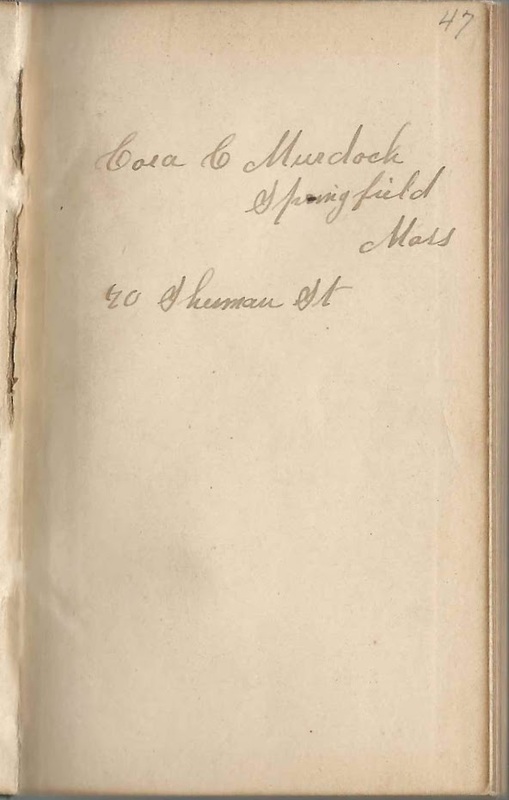 Cora Calista Murdock was February 23, 1853 at Pelham, Massachusetts, the daughter of Emelius Bond Murdock and Phoebe Calista (Chapman) Murdock. Cora mentioned her birthday in the album. 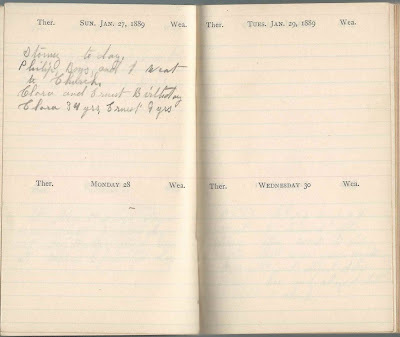 Cora mentioned her siblings Herman Everett Murdock and Clara Maria (Murdock) Potter, wife of Philip Henry Potter, in the diary, especially Clara and her family, and I believe Cora lived with them, at least part of her life. Cora, whose musings were generally matter-of-fact and not full of detail, made a few observations about a baby, presumably Clara's baby, who was sick, then better, and then sick again. 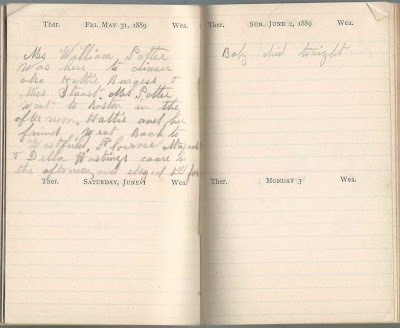 Then suddenly, the June 2, 1889 entry: "baby died tonight". 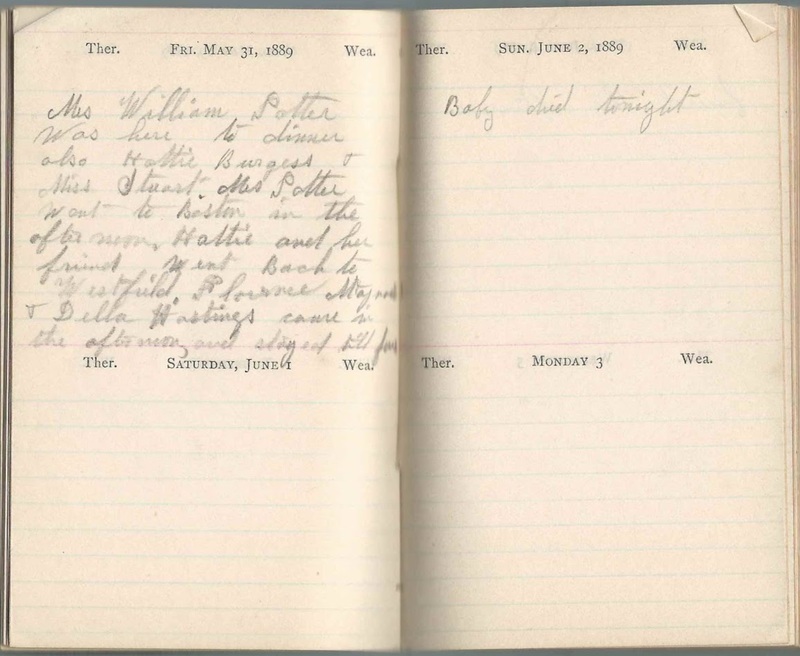 "Baby" was William Dimmock Potter, who was born December 23, 1887. Clara and Philip had, I believe, four or five children, but only two sons survived to adulthood. Cora mentioned their birthdays in her diary. 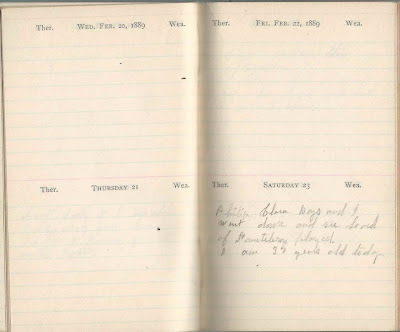 Philip Arthur Potter, "Arthur", was born January 8, 1878. 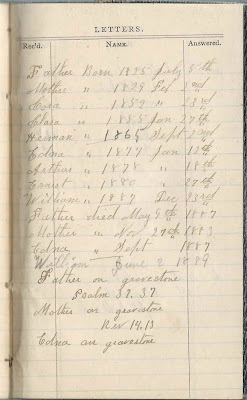 As noted in the diary entry, Clara and her other son Ernest Murdock Potter were born on January 27; Clara in 1855 and Ernest in 1880. 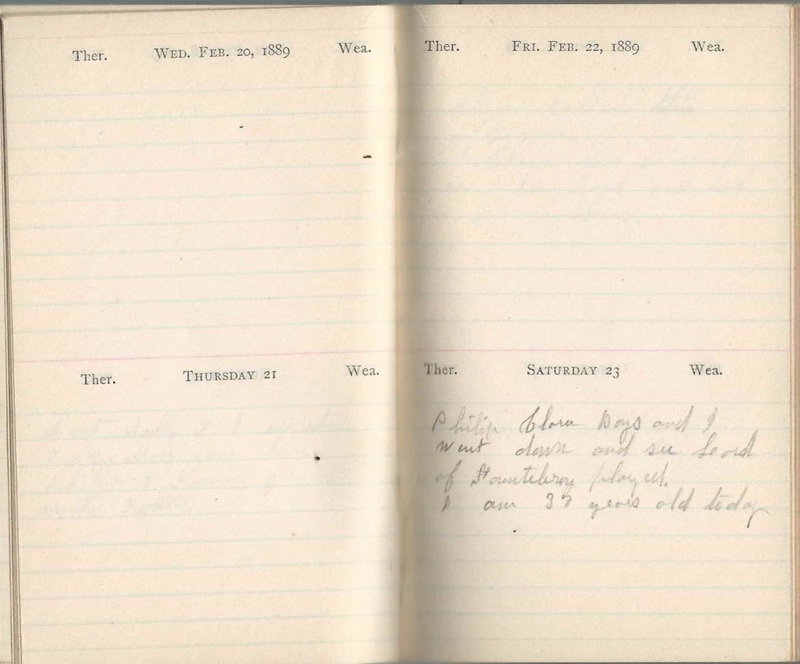 Near the end of the diary, in the section marked "Letters", Cora wrote the birth dates of her family members. The 1900 Census found Cora living with her sister Clara, husband Philip, an their two boys at Springfield, Massachusetts. Cora died in 1902 at Brookfield, Massachusetts. If you have corrections/and or additions to the information above, please leave a comment or contact me directly. Aunt Mary and Anna. Perhaps Mary Jane Chapman, sister of Cora's mother Phebe Calista (Chapman) Murdock. 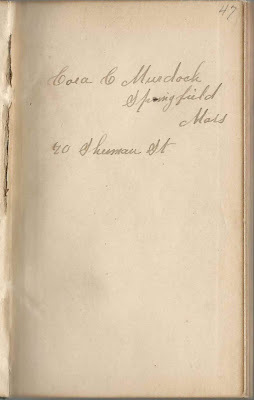 Cora's father, Emelius Bond Murdock, had a sister Mary Ann (Murdock) Smith, but she died in 1860. Martha. Cora had a cousin Martha, daughter of Abraham Murdock, a brother to Cora's father Emelius Bond Murdock. Aunt Alice & Uncle Dwight. 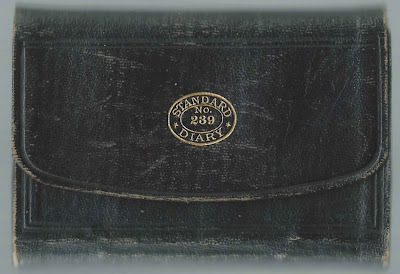 Alice (whose maiden name I don't know) was the wife of Dwight Morton Chapman. Uncle Lucius and Aunt Cornelia. They were Lucius Newton Fay and wife Cornelia Elizabeth (Chapman) Fay, who was a sister to Cora's mother Phebe Calista (Chapman) Murdock. Aunt Lucy; presumably Lucy B. (Murdock) Knowlton, sister of Cora's father Emelius Bond Murdock. Cora C. Murdock of ? Sherman Street, Springfield, Massachusetts. She was the diary owner Cora Calista Murdock. Uncle Elijah and Aunt Nancy; Elijah G. Murdock and wife Nancy A. (Pond) Murdock. Elijah was a brother to Cora's father Emelius Bond Murdock. Mrs. T. D. Potter and Charlie; presumably Leora A. 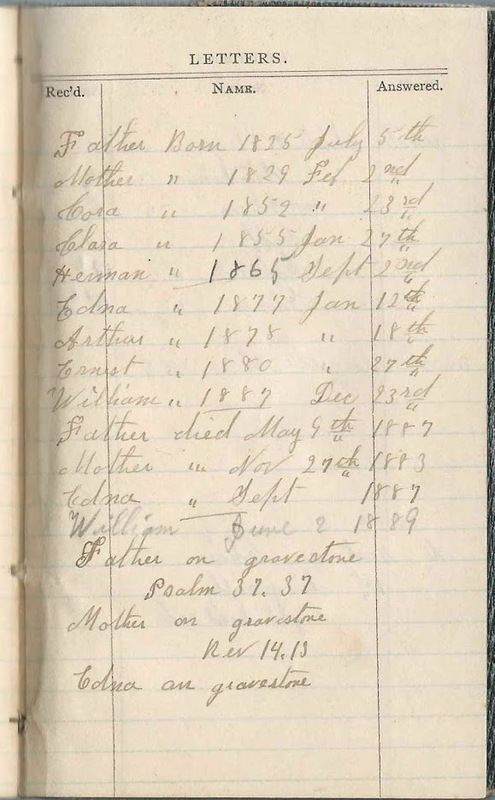 (Albro) Potter, third wife of Timothy Dimmock/Dimock Potter, brother of Philip Henry Potter, husband of Cora's sister Clara Maria (Murdock) Potter; and Charles S. Potter, son of Timothy Dimmock Potter and his second wife Laura A. (Atwood) Potter. "Arthur was 11 years old today". Cora's nephew Philip Arthur Potter, born January 8, 1878, son of Philip Henry Potter and Cora's sister Clara Maria (Murdock) Potter. Philip; Philip Henry Potter, Cora's brother-in-law, husband of Cora's sister Clara Maria (Murdock) Potter. Ernest Murdock Potter, son of Philip Henry Potter and wife Clara Maria (Murdock) Potter, Cora's sister.